Well, a picture tells a thousand words…and here’s a picture you don’t see every day. 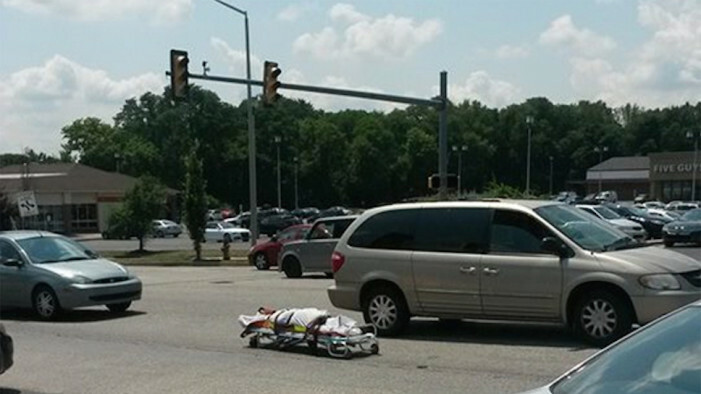 Nope, it’s not footage from Jackass Presents: Bad Grandpa, but an actual mishap out of Bucks County, Pennsylvania. A coroner’s van was being driven on a busy stretch of road in the area of Feasterville, when the door swung open and out flew a body strapped to a gurney, wrapped in a white sheet. One Good Samaritan named Bradley immediately rushed to the scene to help get the body back in the van, but he actually thought it was a prank, calling it “the most bizarre thing” he had ever seen. Just a thought, but if you’re carrying a dead body in the back of your car, you might want to take one second of your time to ensure that the door is locked. I’m sure the average coroner doesn’t make an awful lot of money, but it is kind of a detail-oriented gig, is it not?